STRATFORD—The Bunnell boys basketball team might have been hosting a winless Pomperaug team on Tuesday night, but the Bulldogs still hadn’t forgotten about last season. The Panthers, playing at home, beat Bunnell by 16 points a year ago and the Bulldogs were anxious to get this year’s shot at their opponent. Bunnell jumped out to a 19-point lead in the first quarter and put four players in double figures en route to an 89-45 SWC victory. 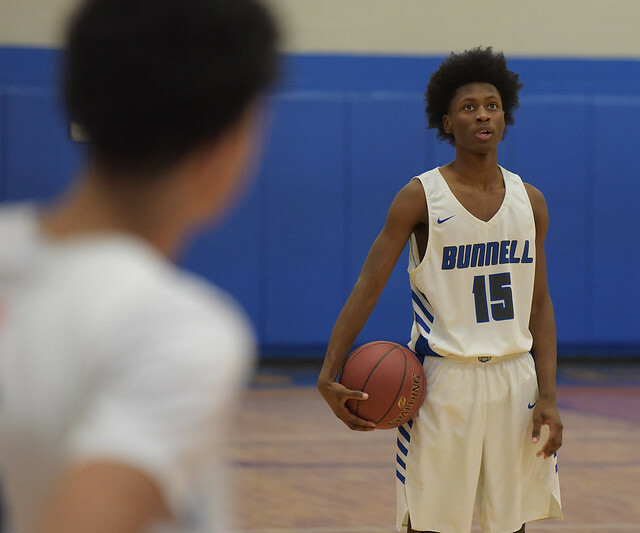 Maximus Edwards scored 17 points for Bunnell, which ran its winning streak to seven games and improved to 9-3 overall. Josh Giannoni’s offensive rebound put back opened the scoring for Bunnell and kick-started a game-opening 11-0 run for the Bulldogs. From there, the Bulldogs sandwiched a pair of 6-0 run around a couple of Pomperaug puckets to take a 23-4 into the second quarter. Six different players scored in that first quarter, setting the tone for the game. Thirteen different Bunnell players scored in the game, giving Edwards plenty of back-up help. Elijah Alexandre added 15 points for Bunnell while Moreland had 11 and Tiyorne Coleman had 10. The Bulldogs kept the pressure on for much of the game, scoring 22 points in the second quarter, 19 in the third and 25 in the fourth, as well. Pomperaug, which slipped to 0-11 on the season, was led by Dion Zhuta’s 15 points. Bunnell will host Weston on Thursday.